Here is a video I made during the University of Texas, Austin Alley Flat Initiative presentation. I have to apologize for the video and sound quality, but I really wanted to share this since it was a very inspirational tour and presentation, including some great quotes and fascinating insights! By no means does this video cover the entire presentation, but is the best I could do at the time. This site is now open for public viewing at the Educators Coop 1 sim in Second Life (SLurl). This presentation really hit home for me, given that demonstrating sustainable residential design principles is the real reason I started using Second Life in the first place. Our Crescendo Design studio focused on sustainable residential design, and Second Life afforded an opportunity to help educate potential clients about the value and importance of green design principles, and how those strategies can be applied without sacrificing design integrity. The Alley Flats installation has truly raised the bar for this application of Second Life. Not only does it describe principles of sustainbility, but it served an integral role in educating students on a University level, and enabled members of the community to experience these designs on a more holistic level than even the most photorealistic illustration or cardboard study model could ever achieve. Given that this project depends on community approval and support, I think this virtual model could go a long way toward helping the general public understand just how well these homes will fit in and improve the fabric of this neighborhood. When you stand in this virtual build, you get a real sense of place, and can more fully appreciate the way these homes will compliment their context. Complete slideshow from the presentation HERE. This video was originally shared on blip.tv by keystone1111 with a Creative Commons Attribution-ShareAlike license. The University of Texas and a community in East Austin recently announced an exciting collaboration in Second Life. 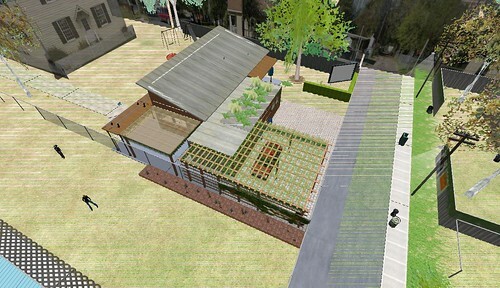 The Alley Flat Initiative <http://thealleyflatinitiative.org/> is a real-world project that combines cutting-edge architectural designs, sustainable development technology and community development in East Austin. 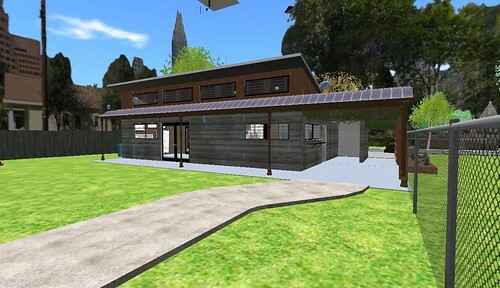 With the help of a UT graduate interdisciplinary communication class, this exciting collaboration will officially unveil specially designed three-dimensional representations of the architectural plans in the online virtual reality environment, Second Life. Alley Flats are small structures of 850 square feet or less that home owners can build as a separate, secondary structure on their lot that can be accessed by alleys to the rear of the property. As communities in East Austin come under pressure because of rising property prices, alley flats can provide an extra source of income for East Austin homeowners that are affordable to build, cheap to maintain, and are sensitive to the environment and local communities. The flats are designed by UT Architecture graduate students under the guiding hand of Professor of Architecture professor Sergio Palleroni <http://soa.utexas.edu/people/profile/palleroni> , co-founder of the nationally recognized BaSiC Initiative <http://www.basicinitiative.org/home.htm> . Professor Palleroni has worked closely with the Guadalupe Neighborhood Development Corporation to find two suitable sites on Lydia and East Second streets in East Austin. The virtual presence of the project is designed to give local audiences a more realistic “feel” for the proposed real-world alley flats. Second Life users will be able to walk through the buildings, see how they blend in with other buildings in the area, and find out about the sustainable technologies and innovative building materials that are the basis of the designs. The Second Life presence is a result of the work of a collaboration between Professor Palleroni’s team and the students of Professor Leslie Jarmon <http://www.utexas.edu/ogs/pdce/jarmon_profile.html> ’s “Communicating Across the Disciplines” <http://www.utexas.edu/ogs/pdce/grs/GRS390P.html> graduate course. 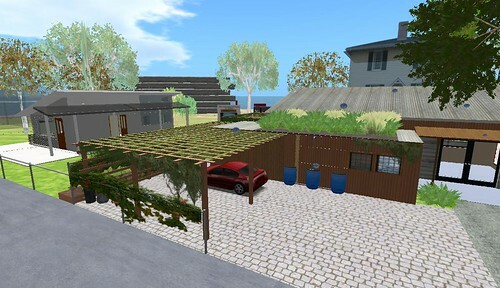 Students in that course worked with Professor Palleroni’s team and expert Second Life builders from the Educators Coop <http://www.educatorscoop.org/> to bring to life this exciting virtual reality dimension of the Alley Flats Initiative. Everyone involved in the project is confident that the Second Life alley flats will be of interest to both local and global audiences interested in community development and sustainable architecture. The site will be open to the public Friday, December 7th. I will update this post with a SLurl as soon as it is available.